You should use everything in your power to attract love and unite or re-unite with your soul mate. You can use crystals to help. Crystals are very powerful and magical. The best crystals for love are Rose Quartz crystals. Crystals are amazing semi-precious stones which have been revered and used for centuries for their healing properties and for spiritual and magical purposes. The Rose Quartz crystal is a form of Quartz with a hardness of 7. It can be found in various hues of pink and is mainly mined in India, China, Chile, and Spain Russia. The Rose Quartz crystal is associated with the Heart Chakra, and so is particularly important in matters concerning the heart, such as love, attraction and emotions. It has profound benefits for the self too. Because of its connection to the heart, it encourages self-esteem, or self-love — vital for anyone who wants to attract a soul mate. Spell Casters will use the Rose Quartz crystal in casing Love Spells. For general healing, this crystal is the best. It can bring comfort and ease pain for emotional and physical ailments, and heartbreak caused by loss, separation, and divorce. For people who are going through pregnancy and childbirth, the Rose Quartz crystal can help regulate hormones and help fertility. The Rose Quartz has important spiritual purposes. It is calming because it is felt to regulate the hormone system. It can also help attract love, protect against negativity, invigorate by promoting youthfulness and fertility, and even help with weight loss. Rose Quartz is an ideal stone for meditation as it helps calm and balance a troubled mind in times of stress. It can help you feel open to love, either from others or for yourself. This crystal is sometimes referred to as the Angel Crystal because many people believe it can help you connect better with your Angels and Spirit Guides. 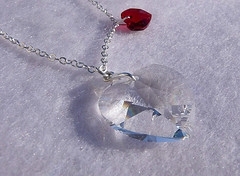 Spiritually, this crystal is connected with the Element of Water, the direction West, the Moon and the Lovers Tarot card. Spell Casters use this crystal to cast spells for attracting love, fertility, healing and protection. Also, many use it in rituals and spells for youthfulness and healthy weight loss. Rose Quartz is the perfect stone for use in meditations, due to its balancing and calming properties. Importantly, this stone can help you to feel more open to love coming into your life, from others, and love of oneself too. Using the Quartz crystal for meditations can help develop and improve psychic ability. This entry was posted in Crystal Glitz and tagged frames, pokedex, smile, validation, videogames on August 13, 2009 by admin.